Annie Musgrove is my grand aunt. She was born on 26 March 1895 in Clitheroe, Lancashire, to parents Thomas Ainsworth Musgrove and Ellen Stowell – my great grandparents. Annie married Percy Procter in Clitheroe on 14 June 1919. I have recently found the following the newspaper article in the Clitheroe Advertiser and Times of 13 June 1956 in which they recount Annie’s recent extended stay in Australia….on doctors orders!! A grand sunny climate, but…. “Follow the doctor’s advice” might well be the moral of this story of a rejuvenated 61-year-old Mrs Annie Procter, who recently arrived back in Clitheroe, after seven years in Australia. It was in August, 1948, that Mrs Procter was advised by her doctor to go and live with her married daughter in Australia – for health reasons. And so Mrs Procter set out on her first sea trip – a voyage across the world. And what a rough trip it turned out to be, too. But Mrs Procter enjoyed the buffetings of the ship in the rough waters of the Indian Ocean – much to the disgust of her less fortunate fellow passengers. Her destination was Moorabbin, a suburb of Melbourne, where she lived with her daughter, Betty, now Mrs B Eastwood, and family. Mrs Procter spent five years at the seaside town of Parkdale, where the climate proved entirely to her liking. In fact, the improvements in Mrs Procter’s health was so rapid, that six months after landing in Australia she started work in the mending department of a woollen mill at Bentleigh, near Moorabbin, and continued working without a break until coming back to this country. Climate? – No complaints, naturally, in view of its recuperative powers. Housing? – The drawback with new housing estates is that drainage and sewerage is not carried out until years after the completion of the building. Consequently, tenants are faced with ankle-deep mud covering the unmade roads after rain. Litter? – Australians are definitely not litter-conscious. Licensing laws? – Peculiar. The present hours, 9am to 6 pm are responsible for queer happenings. Such as the occasion when a young couple, friends of Mrs Procter, went to a ball. In their car they took a zipped bag filled with bottles – a portable bar for use during the evening. It is quite a common sight to see hotels besieged by workers (who finish at 5pm) and the same people emerging at 6pm carrying liquid refreshment to be enjoyed at home. Cost of living? – The biggest drain on people’s wages out there is clothing and furnishings, which are exceedingly costly. Mrs Procter, who is living with her sister and brother-in-law, Mr and Mrs Robert Halstead, at their grocery shop in Curzon Street, greatly enjoyed the voyage back to England – “an absolute contrast to the outward trip” – calling at various ports en route, including Naples where she visited the ruins of Pompeii. Though she has decided to settle down for the time being in Clitheroe, Mrs procter still feels the urge to travel. And no wonder. “After the Australian trip, I feel 20 years younger,” she says. An interesting personal reflection on life in Australia 50+ years ago. Here is what Wikipedia has to say about Moorabbin in Australia now. Ellen Musgrove is my grand aunt – in other words my grandad’s sister. Her parents are Thomas Ainsworth Musgrove and Ellen Stowell, my great grandparents. Ellen was born on 21 February 1881 in Clitheroe, Lancashire. Robert Halstead was born on 31 October 1880, also in Clitheroe. Ellen and Robert were married on 21 Jun 1902. On the occasion of their golden wedding anniversary in 1952 the Clitheroe Advertiser and Times published the following article on 20 June. A quiet family celebration at home tomorrow will mark 50 years of married life for Mr and Mrs Robert Halstead, of 1 Curzon Street, Clitheroe. Mr Halstead, who is 71, is well known to many Clitheronians. He was born in Curzon Street, next door to his present home, and has lived in the street all his life – except for seven years after his marriage, when he resided in Monk Street, just around the corner. He has always taken an interest in music, and was organist at the Congregational Church, Clitheroe, for five years during the war. He was pianist at the Sunday meetings of the old P.S.A. in Clitheroe, and will be remembered my many as pianist in a dance band led by Mr Joe Margerison. Mr Halstead, who, like his wife, worked at Foulsykes Mill for a number of years, had latterly been employed at Sun Street Mill, as an overlooked. He retired in 1947. He is associated with Moor Lane Methodist Church, and is an enthusiastic member of the Castle Park Veterans’ Bowling Club, with whom he has played on several occasions. His wife, Mrs Ellen Halstead, formerly Miss Musgrove, was employed as a weaver at Foulsykes Mill many years ago, and later ran the mixed business at their home. Mr and Mrs Halstead, who were married at the old Baptist Chapel in Shaw Bridge by the Rev L J Shackleford, have one daughter and one grandchild. Mary Alice Musgrove is my grand aunt – in other words my grandad’s sister. Her parents are Thomas Ainsworth Musgrove and Ellen Stowell, my great grandparents. Mary was born on 14 December 1887 in Clitheroe, Lancashire. I have Mary in all the census returns from 1891 to 1911 and in the 1939 Register. I can see from these documents that Mary was employed all her working life as a “cotton weaver”. Mary passed away on 31 October 1952. The following two articles were published in the Clitheroe Advertiser and Times on 7 November 1952. When Miss Mary Alice Musgrove (65), of 11 Brownlow Street, Clitheroe, did not go to work as usual on Friday morning, neighbours became worried and at lunch time one of them broke into the house and found her lying dead at the foot of the stairs, still in her night attire. Miss Musgrove lived alone and was employed as a weaver at Sun Street Mill. A post mortem was held but an inquest was found to be unnecessary. The cremation took place at Skipton on Wednesday of Miss Mary Alice Musgrove of 11 Brownlow Street, Clitheroe, who died suddenly, after a short illness, at her home on Friday. In accordance with her wish, her ashes were later scattered on Pendle Hill. Miss Musgrove, who was 65, was employed for most of her working life at Jubilee Mill. She worked for some time at Foulsykes Mill, and, since it closed 10 years ago, she had been a weaver at Sun Street Mill. Her two brothers and two sisters will have deep sympathy in their loss. Harry Musgrove is my great uncle – my maternal grandfathers brother. He was born 17 November 1889 to parents Thomas Musgrove and Ellen Stowell. I have been lucky enough to find Harry’s WW1 service record on www.ancestry.co.uk. Harry enlisted in Clitheroe, Lancashire on 11 November 1915 – six days before his 26th birthday. At the time he was living at 11 Brownlow Street, Clitheroe and working as a ‘weaver’. He served as a private in the Royal Army Medical Corps (RAMC) and his service number was 103760. It looks like Harry was initially assigned to the ‘home hospital’ reserve in Blackpool, Lancashire. Then in May 1917 he ‘volunteered’ for overseas service – see below. next information about his service shows that he was in Corsica from 9 June 1917 to 31 December 1918. Harry returned home at the beginning of 1919 and according to his service papers was ‘demobbed’ on 23 February 1919 and transferred to the Class Z Reserve. There is a note in the papers addressed to the Officer in Charge at the Queen Mary’s Military Hospital, Whalley, Lancashire. This note was sent with Harry’s ‘medical history’ sheet on 16 January 1919. On one of the documents is stamped ‘sick and wounded’ but I can’t find any information about Harry’s condition at the time. 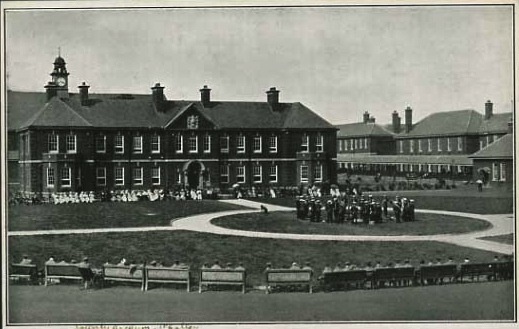 The Queen Mary’s Military Hospital was formerly the Whalley Asylum. It was used as a military hospital until June 1920. There is also a military cemetery attached to the hospital. Harry married Edith Hitchen on 20 January 1940. He died on 25 November 1974 – eight days after his 85th birthday. 1861 Ellen Stowell was born in Burnley, Lancashire. Her parents were John Stowell (1828-1885) and Ann Astin (1831-1902). 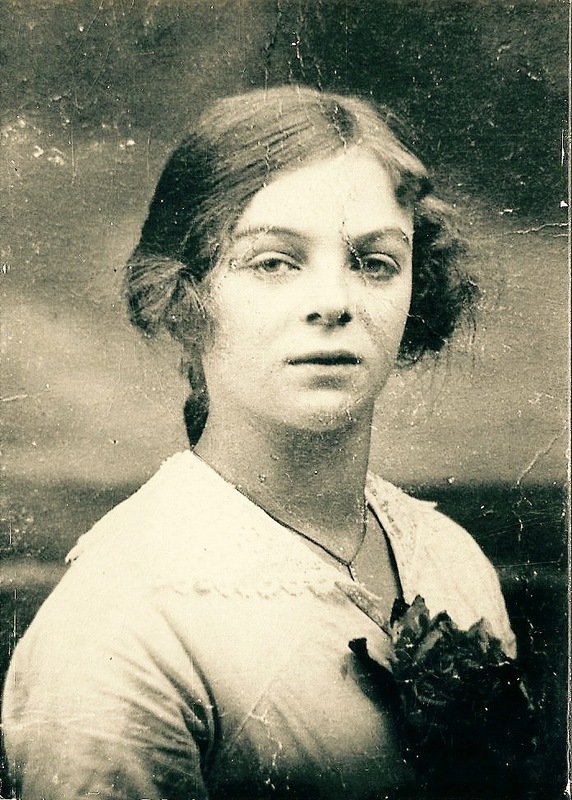 She is my great grandmother. 2007 Doris Musgrove ( nee Jackson) died in Burnley, Lancashire. She was my aunty and married to (Joseph) Harry Musgrove.